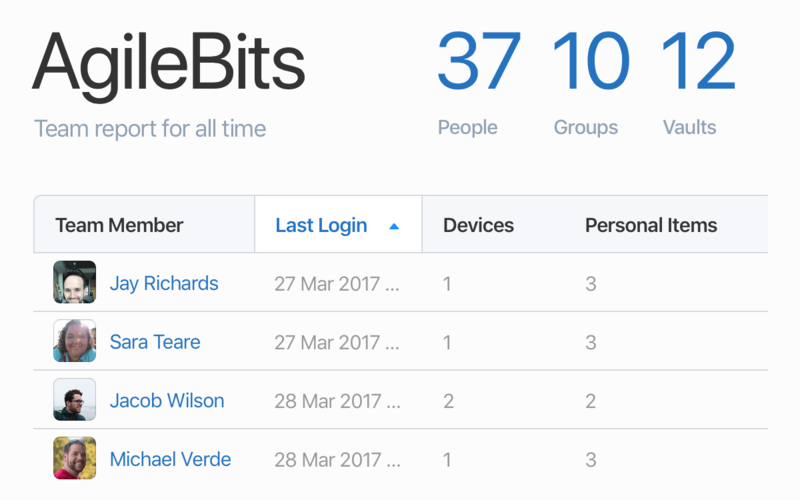 Learn how to create reports to see how your team is using 1Password. With 1Password Business, you can create reports to see who has access to what, and when they’ve accessed it. You can create reports for individual team members or vaults, or for your entire team. You can create reports if you’re an owner, administrator, or part of a group with the View Administrative Sidebar permission. To create a usage report, click Dashboard in the sidebar. Then click Create Usage Report and choose a team member or vault. Access: The number of vaults, groups, and items the team member can access. Usage: A list of items showing when they were last accessed. Access: The number of people and groups with access to a vault. Usage: A list of items showing when they were last accessed, and by whom. When you create a report, you’ll see information for the last month. To see information for a different time period, click Date Range and adjust the selection. You can also adjust Vaults Included (for team member reports) or People Included (for vault reports). If someone can no longer access an item, you’ll see next to the Last Used date. To create a team report, click Dashboard in the sidebar. Then click Create Team Report. You can’t see which items team members have accessed in vaults you don’t have access to, including their Private vaults. You can’t create reports for team members who have been removed from your team.